Great intentions, right? I always have great intentions. I intend to keep up with the housecleaning every day. I intend to post on my blog every day. I intend to keep up with SparkPeople every day. I intend to work-out every day and work on swaps every day and play with my boys every day and and and. I know that I'm over committed. I need to work on that. I need to find a way to do the things I want to do without them being stressful. Because I really do enjoy the things that I do. I love to do things for swap-bot. It keeps my creativity flowing. The same goes for the two role-playing games I'm in. I've been trying, with swap-bot at least, to make sure I'm only signing up for swaps that I know I can keep up with, and most of them are e-swaps, which make it quite a bit easier. On the gaming front, it helps that I have a set schedule for them. Still, I've been missing too many posts. I owe two right now. I love to update my blog. I love to talk about the things that are going on in my life, to share great things with my readers, to reach out to other bloggers and get to know more about more people. I like having the schedule of things, even if I don't get to them as regularly as I'd like. I love having a clean house. However, I hate what I need to do to get it that way. And I hate the way I get when I've spent 3 hours working on cleaning something, only to have the boys come in and destroy it within 10 minutes. It makes me wonder why I do it. And I've tried to get them to clean up after themselves - taking away their privileges when they refuse, or bribing them with more good things when they do what they're supposed to. But they don't like to listen to me. Probably because I'm Mommy. The same goes with exercising. I love having a healthy body. But trying to get into the flow of exercise just doesn't work as well as I'd like it to most days. I'd been doing really good with walking or pilates every day... until I told people about it. Then my commitment went out the window. Why do I do this, I wonder? Why do I set myself up to fail with things? Ok, maybe I'm not meaning to, but it is what happens too often. I keep up with something until I think it's become habit, I tell people about it as a "hey, I'm doing great" and BAM! The habit goes away. I'm trying to find what will work for me. I've been trying to make a schedule every day. But it's so easy for my schedule to get blown out of the water because of the kids and things they need to do, or something coming up at home unexpectedly. So maybe the schedule thing won't work as well as I'd like it to. All I know is that I need to make some changes. I'm thinking of making some changes to my blog - mainly pulling my book reviews out into a blog of their own. Because I feel like I'm fighting back and forth with what to write. If I know that my books have a separate place of their own, it might make it a bit easier. I dunno. I need to change. I need to figure out what I need to change. Maybe I need a vacation. Maybe I need to learn Zen. Maybe I need an epiphany. Who knows. But something's got to give before I do. 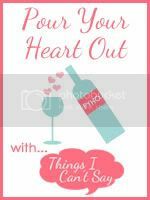 I'm writing this entry today for Pour Your Heart Out, the weekly feature over at Things I Can't Say.